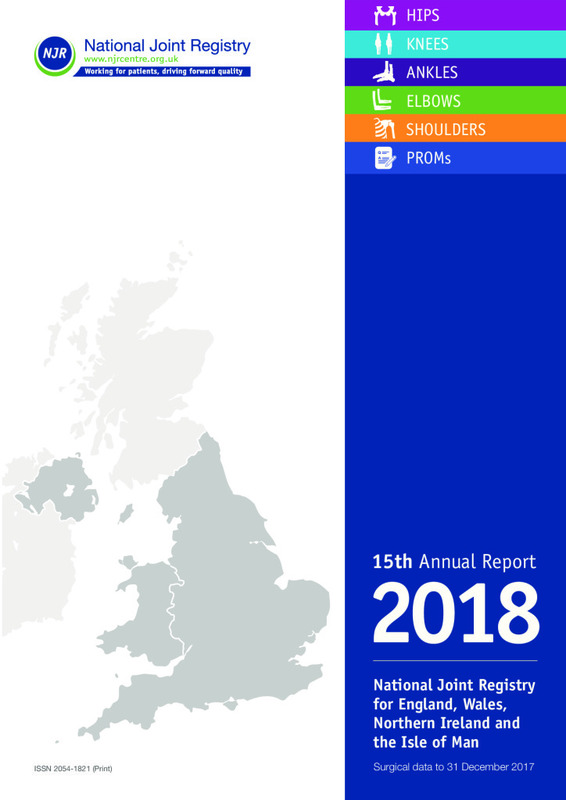 The National Joint Registry [NJR] for England, Wales, Northern Ireland and the Isle of Man, has published a new report today which highlights a record number of joint replacement procedures being performed. Established in 2002 by the Department for Health, the NJR monitors the performance of hip, knee, ankle, elbow and shoulder joint replacements, to improve clinical outcomes for the benefit of patients and to drive forward quality improvements. The 15th Annual Report of the NJR presents patients’ outcome data in relation to hip, knee, shoulder, elbow and ankle replacements. The published figures bring the total number of records in the registry to approximately 2.52 million since data collection commenced in 2003. Almost one million hip replacements and one million knee replacements have now been performed since NJR’s records began. Overall, more joint replacements than ever before were carried out in the year, with over 252,250 cases submitted to the NJR; this equates to c. 10,000 additional joint replacement operations than recorded in the previous annual period. for the majority of patients undergoing hip or knee replacement over the age of 75, the replacement will last for the rest of their lives. Commenting on the outcome data and statistics presented in the report, NJR Medical Director, Mr Martyn Porter said: “The NJR is the largest and most comprehensive national audit of joint replacement surgery in the World. The data in this report allows multiple stakeholders, the most important being patients, to see outcome data on implants and consider patient factors that affect outcome. This will hopefully drive informed decision-making for patients. The most important function of the registry is to actively monitor performance of implants and to identify implants that are not performing as well as expected, so that the appropriate follow-up action can be taken by the regulator. This is fundamental to patient safety. The results of the report will be launched today at the British Orthopaedic Association’s Annual Congress in Birmingham to an international delegation of more than 1,000 joint replacement surgeons.